There are 23 desktop wallpapers listed below. You are on page 1 of 3. The files are sorted by number of votes, beginning with the most popular content. You can vote for wallpapers by adding them to your Favorites list. 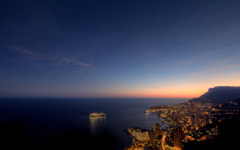 Evening shot of Monaco cityscape during the 2011 F1 Grand Prix. You usually don't see so many yachts outside the port (and people inside the port) during the year unless its F1. Enjoy! Just in time, before the last sunlight disappeared for the night. As Monaco is getting ready for the Grand Prix 2011, I used the chance to climb into the large steel frame construction for the giant screen above the port to get a nice angle for this pic. 5 exposure HDR at f/11. Enjoy! Finally! 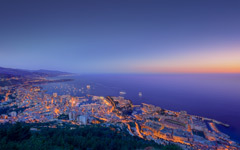 After waiting for several weeks I finally got the chance to catch a clear twilight sunrise over Monaco. Getting up at 4.30am and then hiking uphill (steep!) for 1 hour straight wasn't easy, but totally worth it! 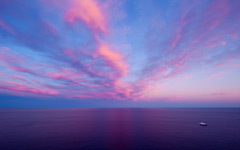 Also check out the pics of the actual sunrise in my wallpaper section on my website. Enjoy! Canon EOS 5D Mark II, Canon EF 14mm f/2.8L II USM shot at f/11. 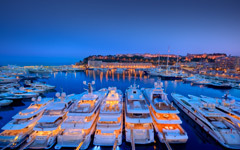 A 9-exposure HDR panorama of the Monaco Yacht Show 2012 shot during twilight before sunrise. 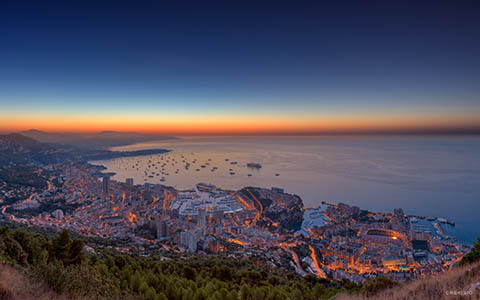 While waiting for the Sun to set for a new Monaco cityscape twilight shot, the clouds over the sea towards the Italian border were nicely lit. 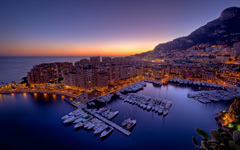 And together with the yacht going back into the port of Monaco for the night, I was very lucky with this situation. One RAW shot with slight increase in vibrance. Enjoy! 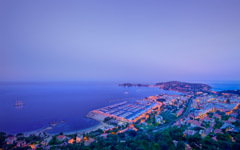 An evening shot taken from a cliff over Beaulieu Sur Mer (French Riviera) with St. Jean Cap Ferrat in the background. Enjoy! 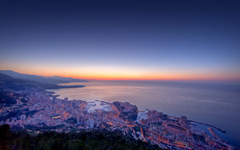 An evening twilight shot from the Mont Agel, near the Nice Air Base Station located at the top of the mountain (1,148m). Weather conditions were superb, clear, clean air, almost no humidity or wind. 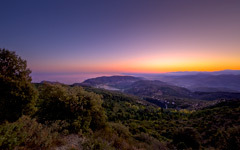 View is up to 80km to the terrains of Saint Tropez. 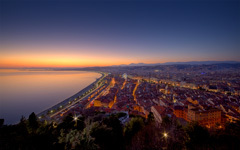 3-exposure HDR with a 14mm wide angle lens.